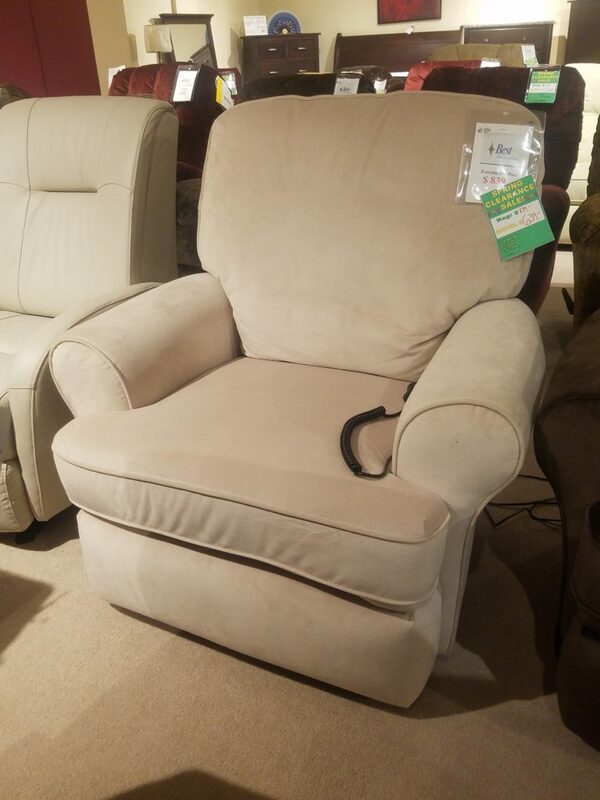 Recliner features long lasting perfect comfort with it's eight way hand tied double cone spring system and all solid Russian Birch hard wood frame! Shown in Top Grain leather on all panels, but comes in your choice of designer fabrics as well. Made in Hickory, NC. 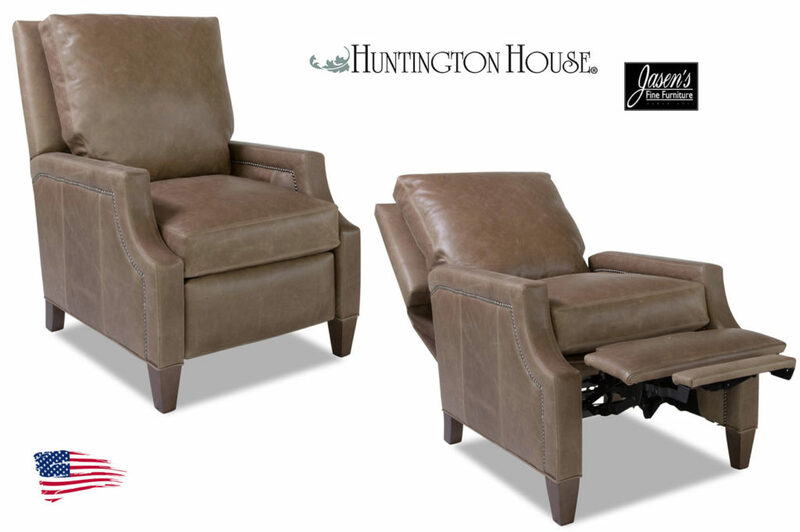 Alexvale v3d0-31 recliner features transitional styling while being a comfortable recliner. Available in manual push back or power with your choice of 100s of fabrics or leather. Made in USA! 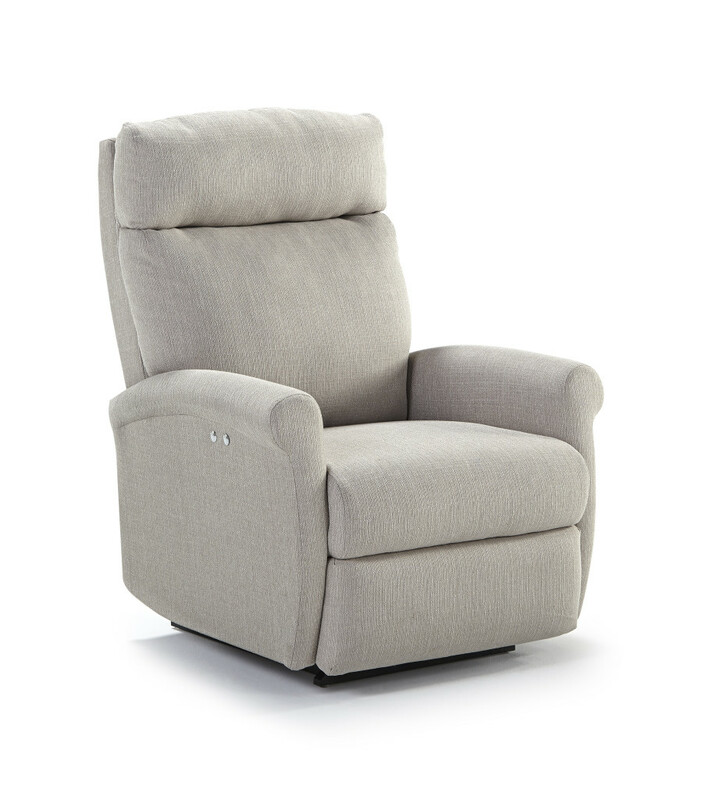 Alexvale v740-31 recliner chair features high leg style reclining with attached back and track arms. 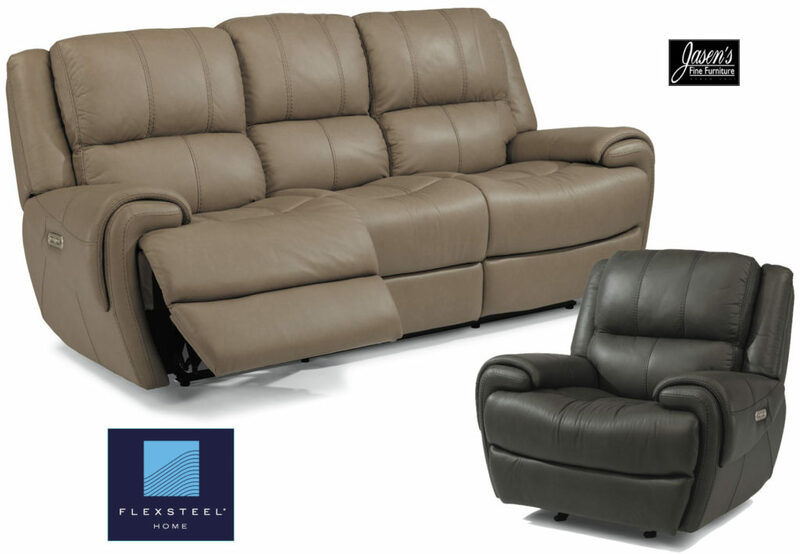 Available in either manual push back or power reclining mechanisms with your choice of 100s of fabrics or leather! Made in USA! The Everett features soft, traditional styling that is accented with nail head trim throughout. The high leg chair also features turned spool feet, full grain leather on all panels, and power headrest and chaise! The chair also is available in 3 colors; brown, emerald, and deep blue. The reclining sofa and loveseat feature power chaise and lumbar! The Rio is available in fabric in addition to leather. The pieces available in the series include sofa, loveseat, console loveseat, chair, and sectional. Each seat features two switches and usb charging port for ultimate comfort! The two switches enable control for the chaise and headrest! Each seat features so much control that the positions are nearly limitless. 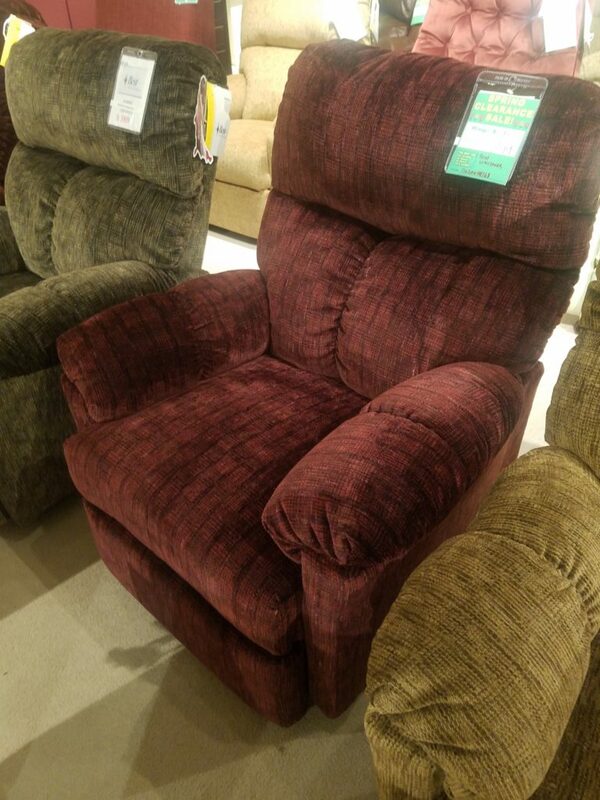 Best Brosmer Power Recliner was $659 now $559. 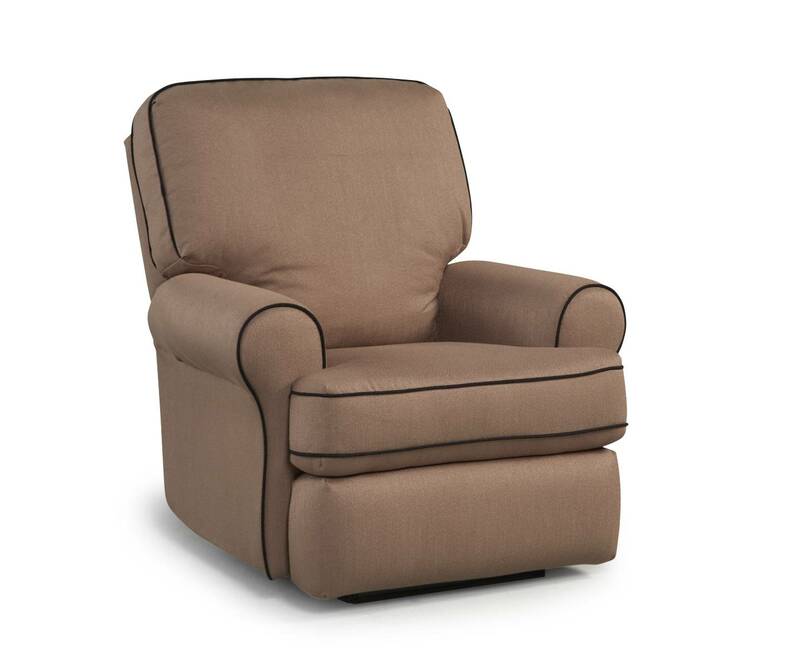 Best Sondra Recliner Tan - was $499 now $429. 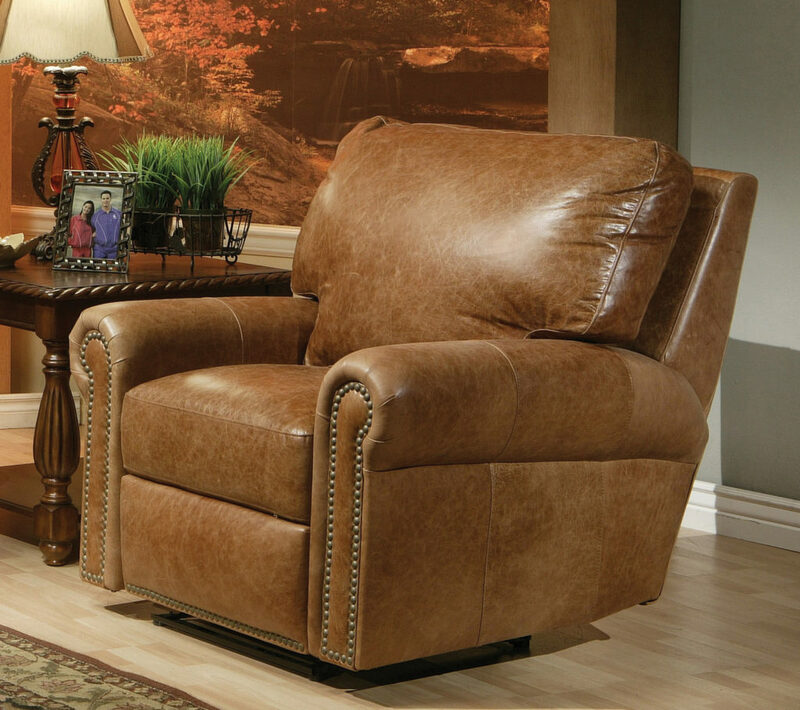 Best Wanderer Taupe Leather Recliner - was $599 now $499. 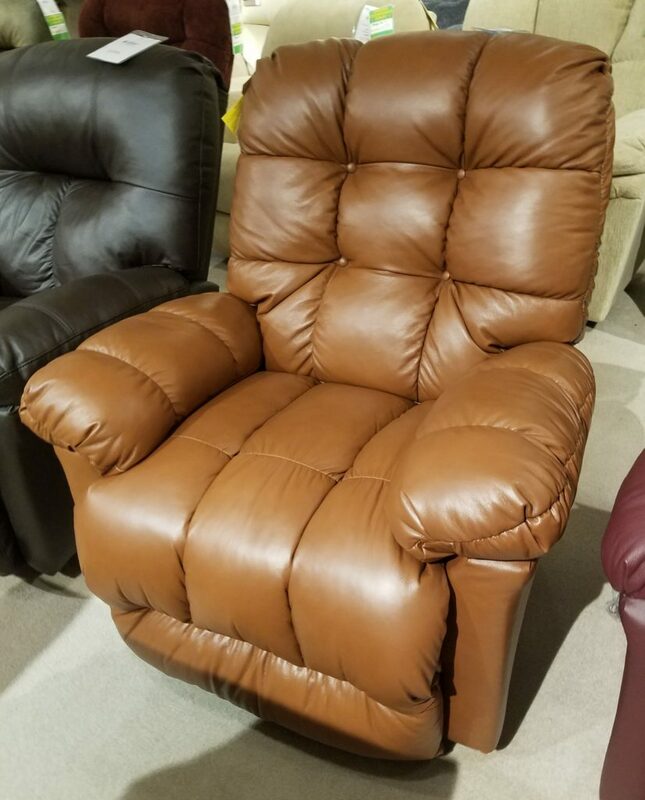 Best Wanderer Brown Leather Recliner - was $599. now $499. 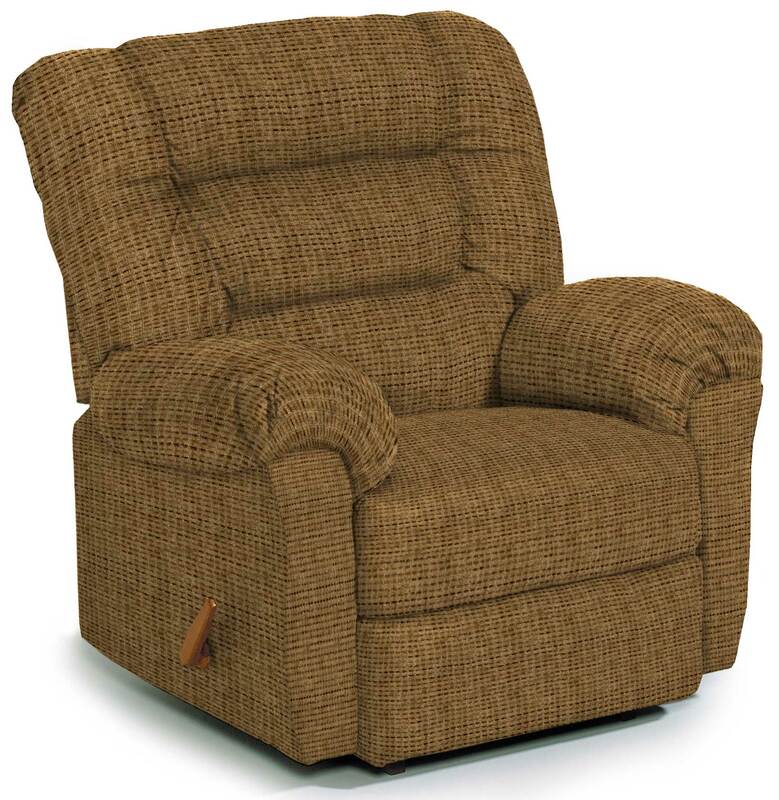 Best Tyrp Power Recliner Brown- was $839. now $739. Best Todd Recliner Wine - was $389. now $299. Best Tryp Power Recliner- was $839 now $639. 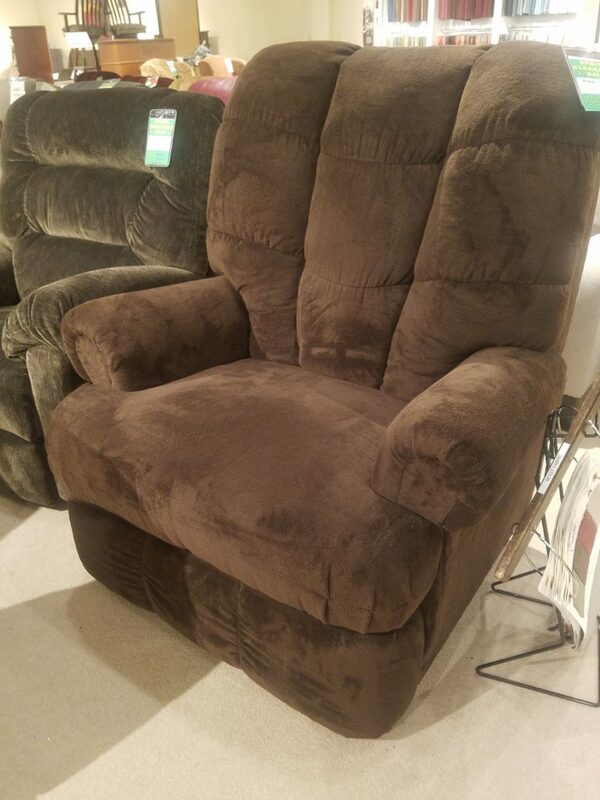 Best Bruticus Big Man's Recliner- was $1029 now $929. Clearance, was $1599 now $1449. Clearance, was $799. now $699. 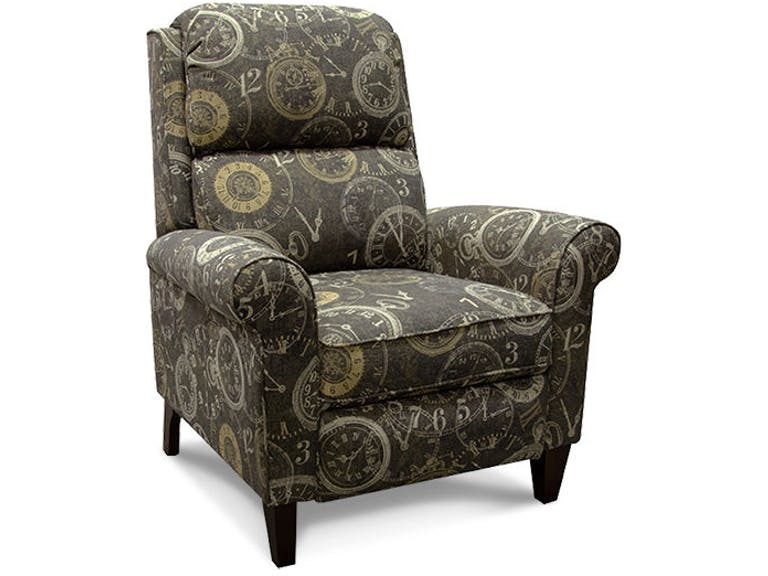 Omnia Fairfield Recliner Chair features power reclining with nail heads. The chair can be ordered in over 200 leathers and several nailhead colors! Matching Sofa, Loveseat, and Sectional configurations are available. Made in USA! H- 40" W- 40" D-40"
The high leg recliner comes in power however, but also manual. The reclining chair exudes elements of Mid-Century design while maintaining enough contemporariness. The seat cushion features encased coil springs hence long lasting comfort. Fabrics that are available are nearly limitless with nearly 700 to choose from. The feet finishes are another option that include walnut, black, pecan, and riverloom. Made in Ferdinand, IN USA. Chair size: H-43" W-31" D-37.5"
The reclining chair exudes elements of Mid-Century design while maintaining enough contemporariness. The seat cushion features encased coil springs hence long lasting comfort. Fabrics that are available are nearly limitless with nearly 700 to choose from. The feet finishes are another option that include walnut, black, pecan, and riverloom. Made in Ferdinand, IN USA. Chair size: H-41" W-29.5" D-36"
The high leg recliner comes in power however, but also manual. The reclining chair exudes elements of Mid-Century design while maintaining enough traditional. The seat cushion features encased coil springs hence long lasting comfort. Fabrics that are available are nearly limitless with nearly 700 to choose from. The feet finishes are another option that include walnut, black, and riverloom. Made in Ferdinand, IN USA. 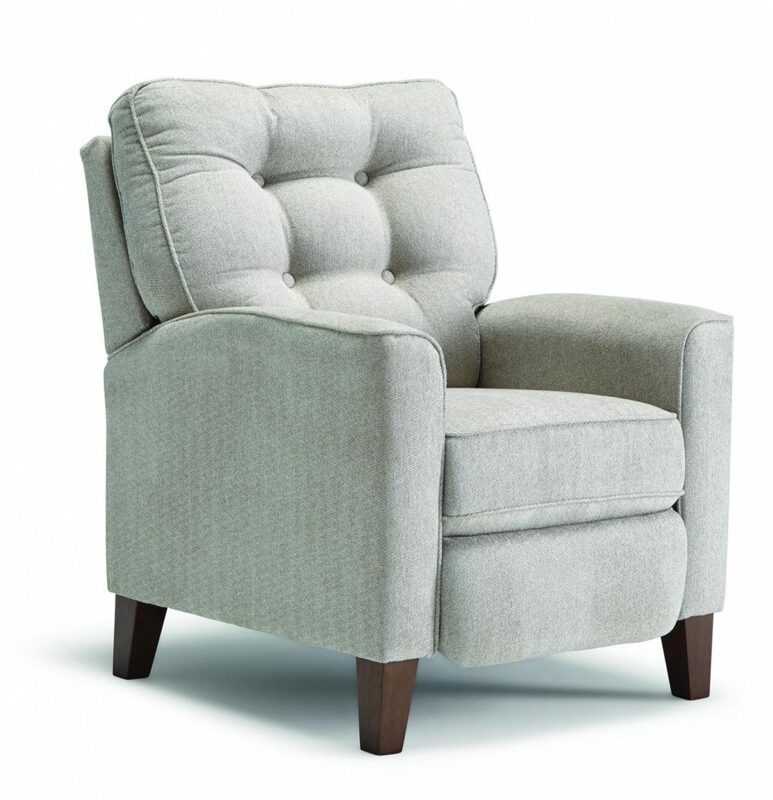 Chair size: H-41.5" W-31.5" D-38"
The Prima features simple yet elegant styling along with the square arms and tapered legs. The high leg recliner comes in power however, but also manual. The reclining chair exudes elements of Mid-Century design while maintaining enough traditional. The seat cushion features encased coil springs hence long lasting comfort. Fabrics that are available are nearly limitless with nearly 700 to choose from. The feet finishes are another option that include walnut, black, and riverloom. Made in Ferdinand, IN USA. Chair size: H-45" W-33" D-37.5"
The reclining sofa and chair feature power chaise, headrest, and lumbar! The Cade is available in two unique yet timeless leathers. The leathers available are a stylish charcoal black or tan. Each seat features three switches and usb charging port for ultimate comfort! The three switches enable control for the chaise, lumbar, and headrest! Each seat features so much control that the positions are nearly limitless. 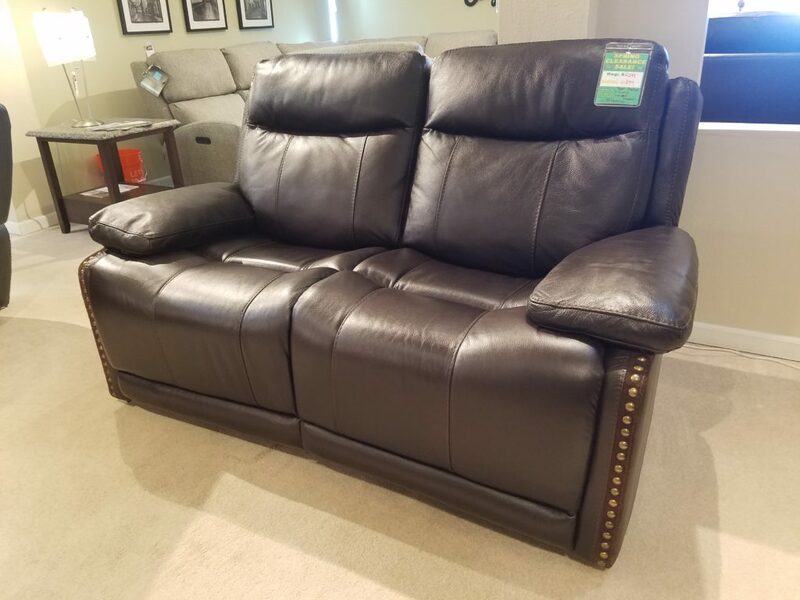 Sofa: H 43" W 88" D 42"
Chair: H 43" W 44" D 42"
Bishop LEATHER POWER HIGH-LEG RECLINER WITH POWER HEADREST Nailhead trim highlights a traditional style. Bishop’s traditional style features a divided back cushion for soft comfort. Its elegant look is garnished with nailhead trim throughout that lines the back wings, front and sides of its base, and arm fronts. Relax in Bishop for never-ending luxury and relaxation. 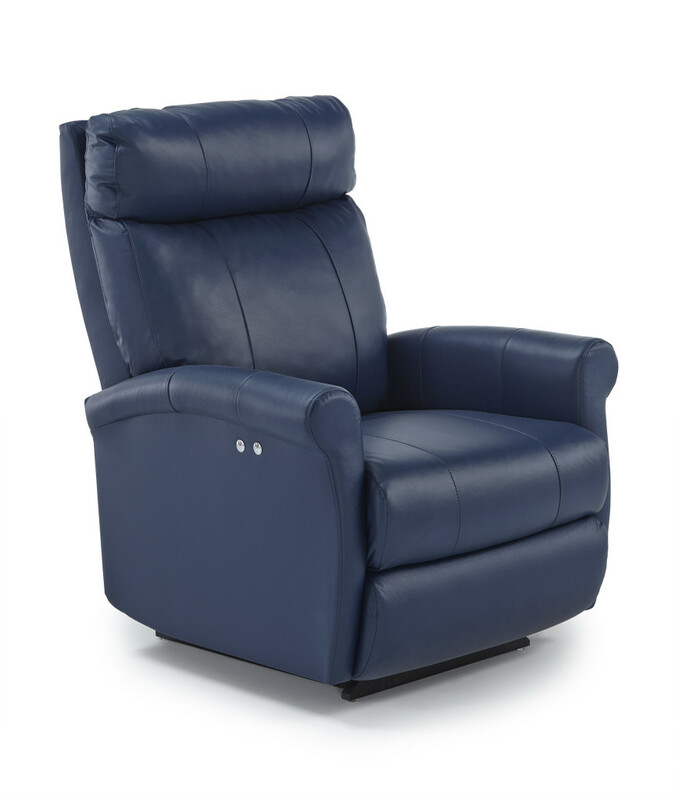 A power reclining mechanism lets you change angles effortlessly from an upright to a fully reclined position, and a power button control allows you to independently adjust the headrest for custom relaxation. 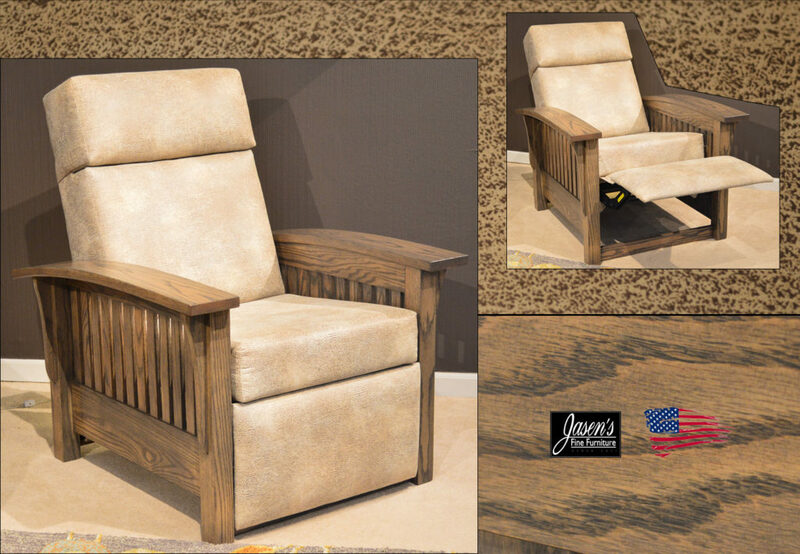 The Owen comes with power headrest, lumbar and chaise for maximum comfort. 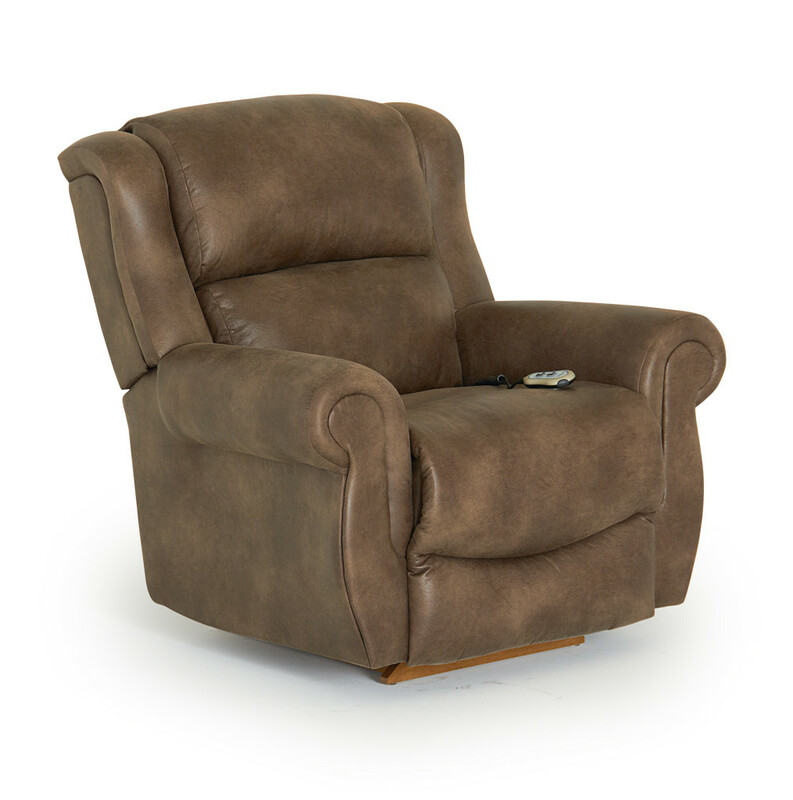 The recliner comes upholstered in a durable, soft, suede-like fabric. We stock the brown color shown, but it is also available for order in a light grey too. This product also comes with Flexsteel's robust lifetime warranty on the springs, frame, mech, foam, and 5 years on electrical. The controls are simple, yet functional with a home button to reset the chair. In addition to being reliable yet comfortable the chair also has a USB port for charging. Overall dimensions of the chair: 42"h * 36"w * 42"d.
The Around Town comes with power headrest and chaise for maximum comfort. 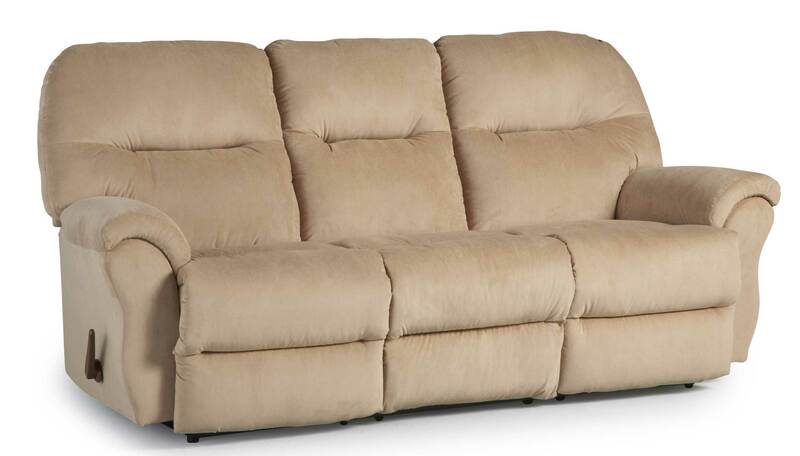 The sectional comes upholstered in a soft, durable, polyester fabrics. When ordered in any of the 3 fabrics the sectional is a part of the Downtown series of the Around Town style. The series is also available in Leather (Crosstown). This product also comes with Flexsteel's robust lifetime warranty on the springs, frame, mech, foam, and 5 years on electrical. The controls are simple, yet functional with a home button to reset the chair. In addition to being reliable yet comfortable the chair also has a USB port for charging. Overall dimensions of the sectional: 40'H x 104' * 117'W x 40'D. The Zoey comes with power headrest and chaise for maximum comfort. 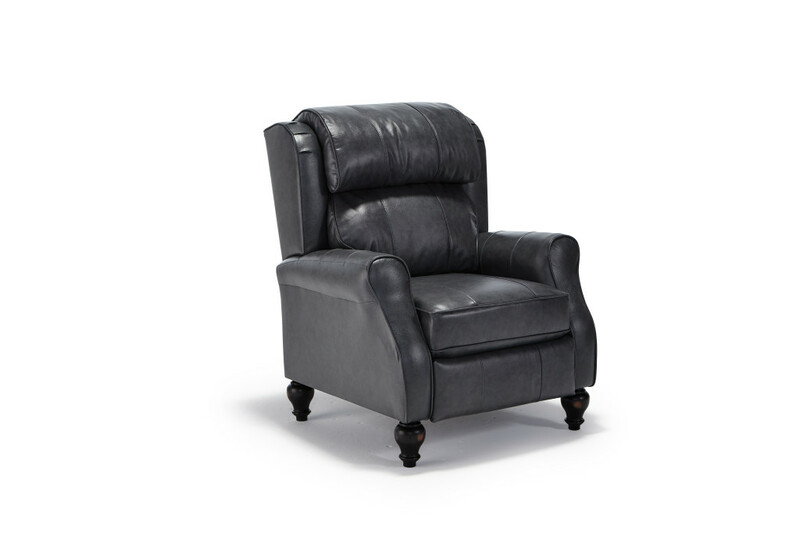 The recliner comes upholstered in a supple, pebbled, dark brown or grey top grain leather. This product also comes with Flexsteel's robust lifetime warranty on the springs, frame, mech, foam, and 5 years on electrical. The controls are simple, yet functional with a home button to reset the chair. In addition to being reliable yet comfortable the chair also has a USB port for charging. 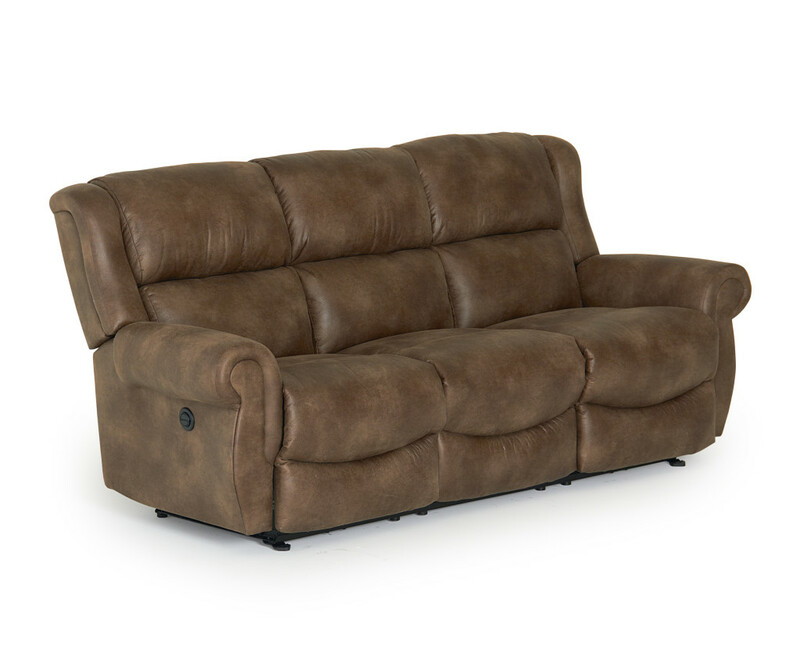 Overall dimensions of the sofa: 43"H x 85"W x 43"D. Overall dimensions of the chair: 43"H x 41"W x 43"D.
The Chaz features supple, yet durable top grain stone color leather on the seating. 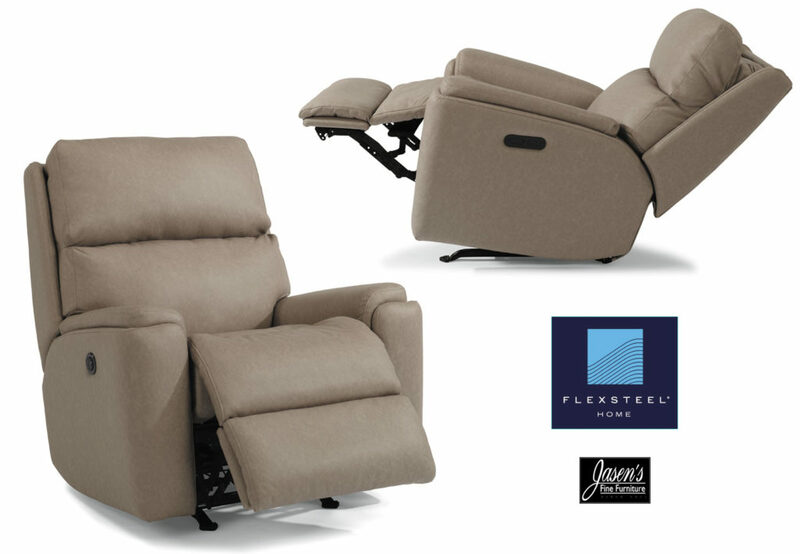 The full power reclining will make your living area a place of pure comfort. The pieces also feature USB ports on each of the reclining button modules. The USB ports will ensure that settling in after work will be an after thought. Give the Chaz a try or you will be sorry that you didn't! The Chaz is available as a Power sofa, Loveseat, Console Loveseat with cup holders and storage compartment, and Glider Recliner Chair. 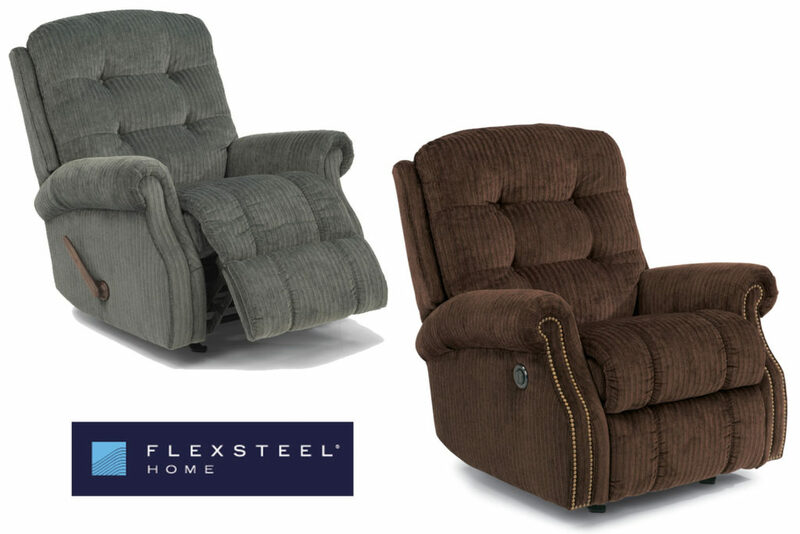 Flexsteel Hercules is designed for larger individuals that demand more from their recliner chairs! The Hercules features clean tailored panel arms and luxuriously styled biscuit style back. Flexsteel boasts that this chair will accommodate occupants weighing up to 400 pounds. 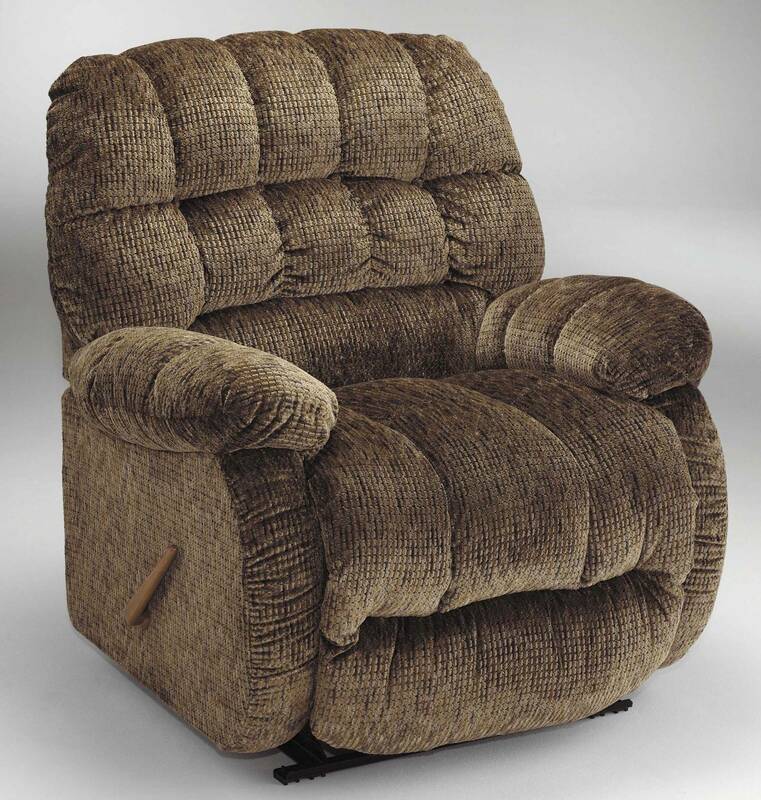 The recliner comes in a large variety of fabrics that are very durable and sometimes even stain resistant. There are two mechanism choices for the Hercules including wall saving and power wall saving. The chair can also have a USB charging port added to the power reclining option. The Hercules will meet or exceed your expectations for those that need a chair that will last for people that find chairs big enough to fit them! 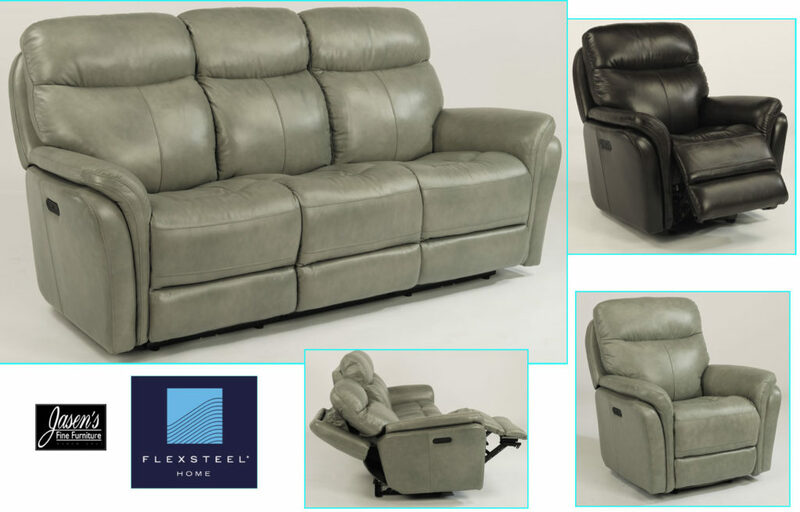 The Flexsteel Nance features space age styling, saddle seating, full power chaise and headrests, and top-grain leather seating. The series comes in your choice of two beautiful leather colors. The colors that are available are grey or tan. The chair is shown in the grey leather on the right. The sofa is shown in the tan leather on the left. The series is also available in a cloth as well. The power buttons are also on a stylish, modern plate with a home reset button. The home reset button makes it convenient to return the seat to it's original position. The luxury of the series is also in enhanced with a USB port to charge your devices in each reclining seat. 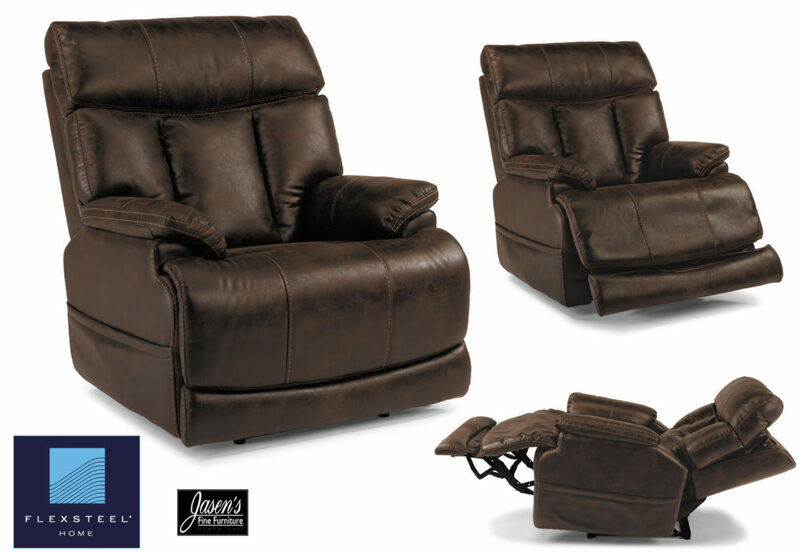 The Nance series is available in the following pieces: Sofa, Loveseat, Console Loveseat, and Gliding Reclining Chair. Console Loveseat: H:41" W:81" D:42"
The Rio is a unique chair with it's layered track arm that highlights it's lines. The chair is available in multiple mechanisms to ensure anyone can find the right feel! 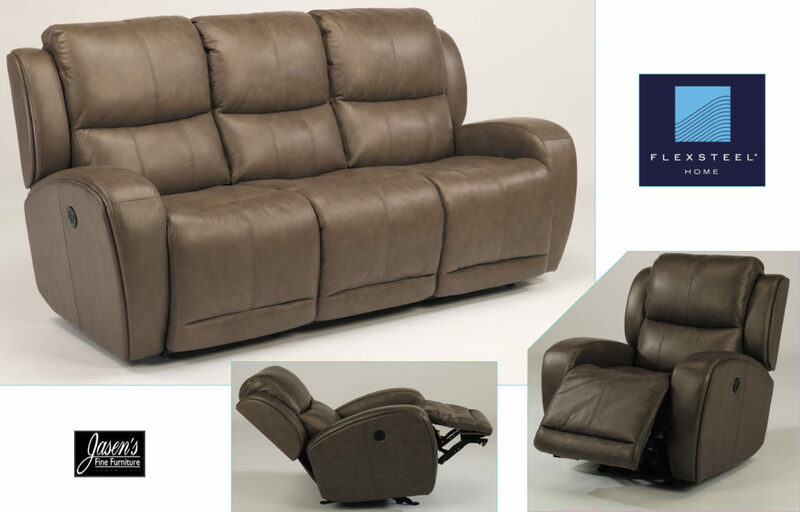 Mechanisms that are available on the Rio include rocking, wallhugging, power recline, power recline with power headrest, and swivel glider recliner. The recliner can be ordered in 100's of fabrics of your choice. 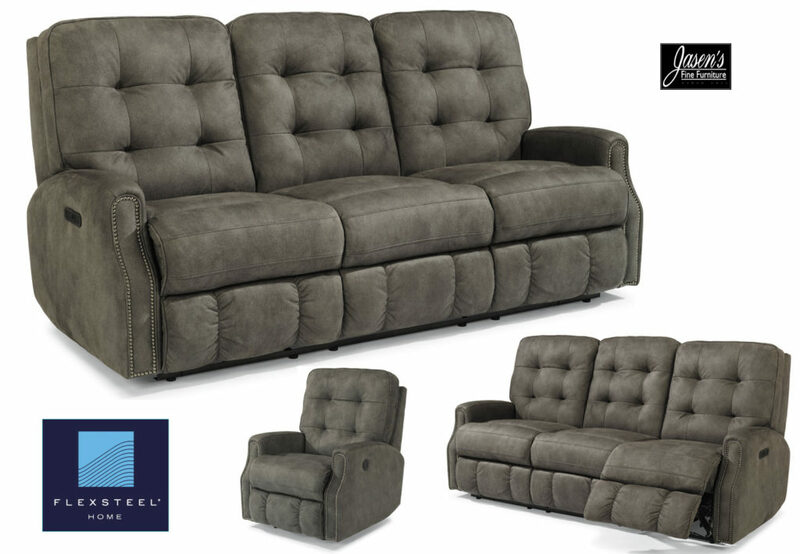 This reclining series features transitional styling with it's tufted back and black nickel nail trim. The series can also be ordered with out the nail heads or in any fabrics and leathers. The Devon is also available in a sofa, loveseat, console loveseat, and chair. Each piece has multiple mechanisms that are available for a large assortment of combinations for your room. The set can also be ordered with power reclining chaise and power reclining headrests. Lastly, the power reclining with power headrests feature comes with a USB port for charging your devices while you relax! 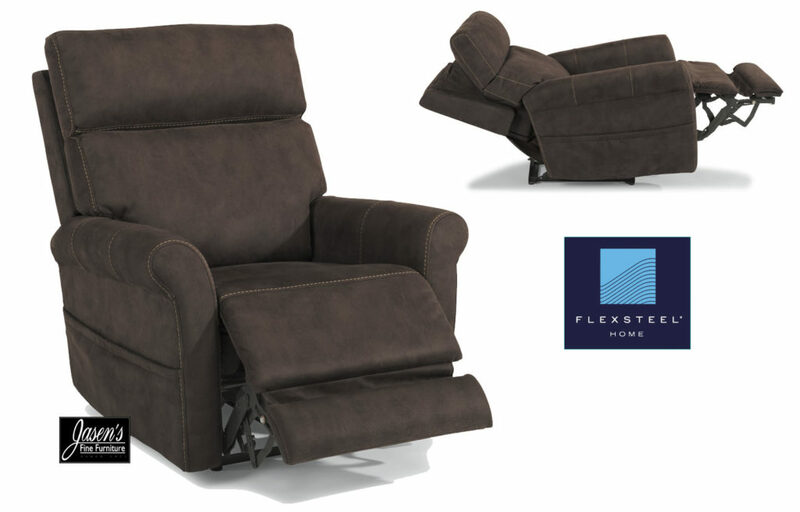 The Flexsteel Clive recliner features power reclining, power headrest, and a power lumbar. 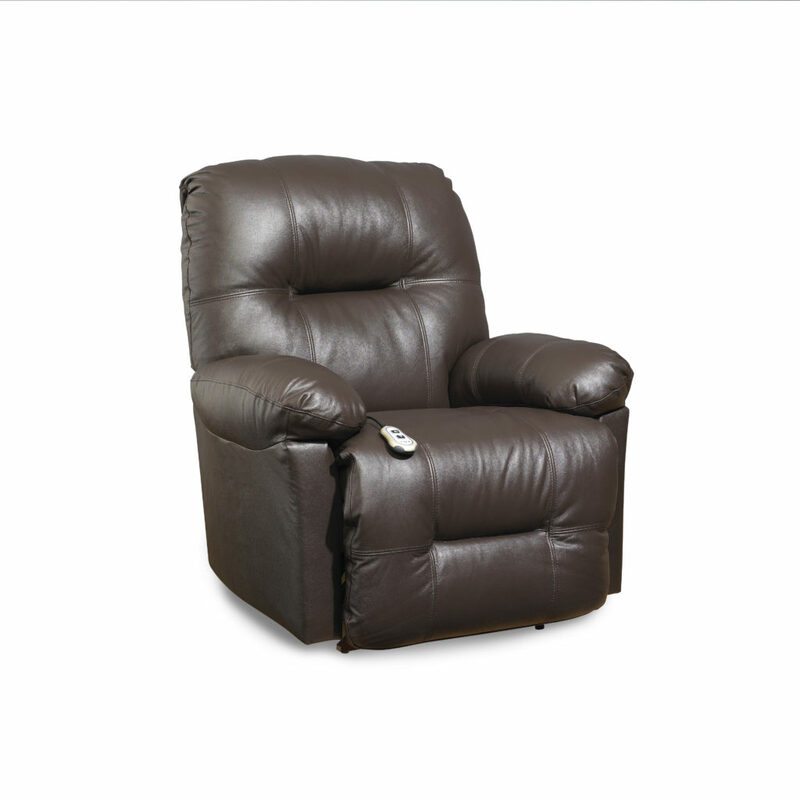 The recliner is the ultimate in adjustable comfort with it's three different powered areas. The chaise on the recliner is unique, yet practical because it extends out as the chair reclines. The chair comes in your choice of suede like fabric (as shown on our floor) or leather. The remote for the chair can be stored in a pocket on the side of the chair and also features a USB port for charging! 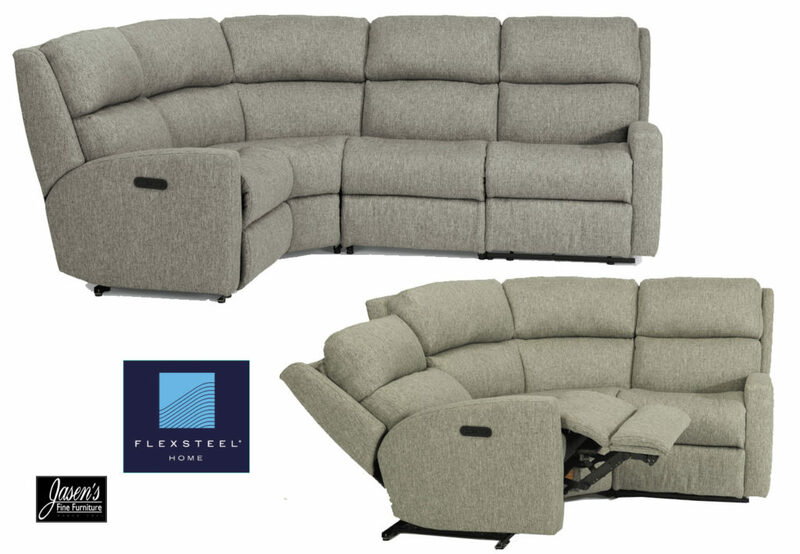 H- 43" W- 43" D- 36"
Flexsteel Sectional features bolstered seating, padded chaise footrests, power reclining, and tilt headrests. The series also has a number of different pieces that are sure to accommodate your home's needs. In addition, an added benefit to the power is the usb ports located on the control pad for reclining. You can charge your favorite devices while you relax. The sectional can even be ordered as a home theater style seating. Optional console pieces that feature cup holders can be used to make a home theater. Console pieces are also a great addition to the sectional based configurations! The recliner features solid oak construction while the sturdy designer fabric has a leather-like appearance. The chair demonstrates old world style, yet a modern gray stain that's sure to wow your guests. 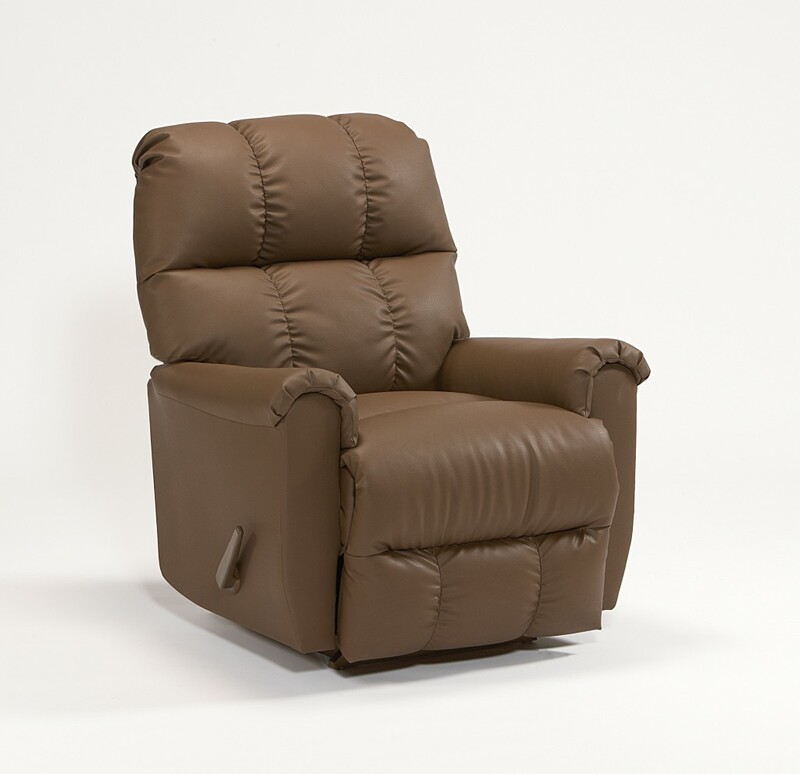 The recliner only uses the very best materials for it's foam seating, mechanism, and coverings. Options for the chair while many are: the wood specie of your choice with any stain color, 100's of fabrics, and dozens of leathers. Made in USA by real Amish craftsman with detail to every aspect from lumber selection to tailoring. 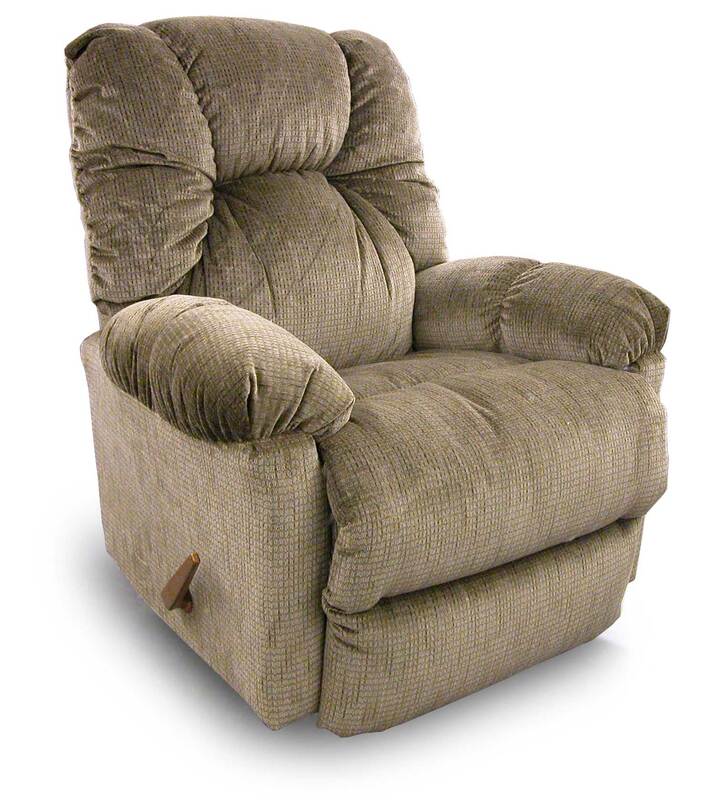 Best Zaynah recliner features baseball stitching, padded through chaise, and plush feel. 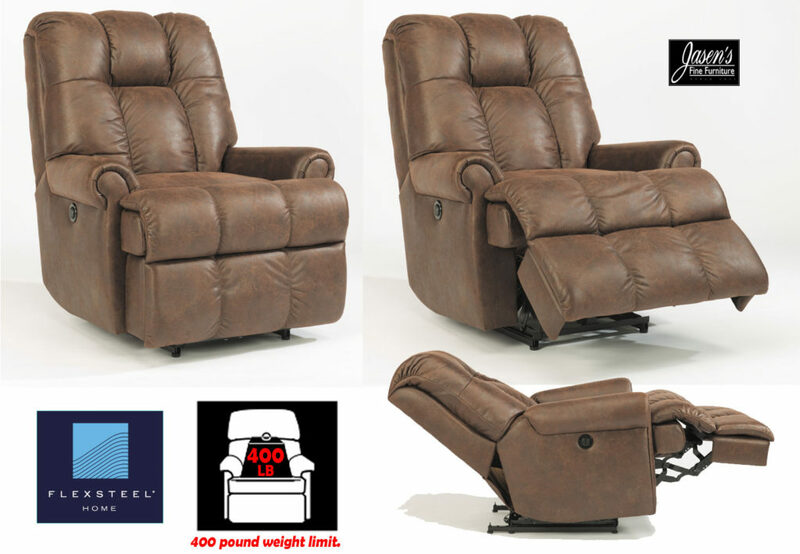 Available in leather only with 3 color choices in the mechanism of your choice including: Space Saver, Swivel Glider, Rocker, Swivel Rocker, Power Rocker, Power Space Saver, and Lift Recliner. 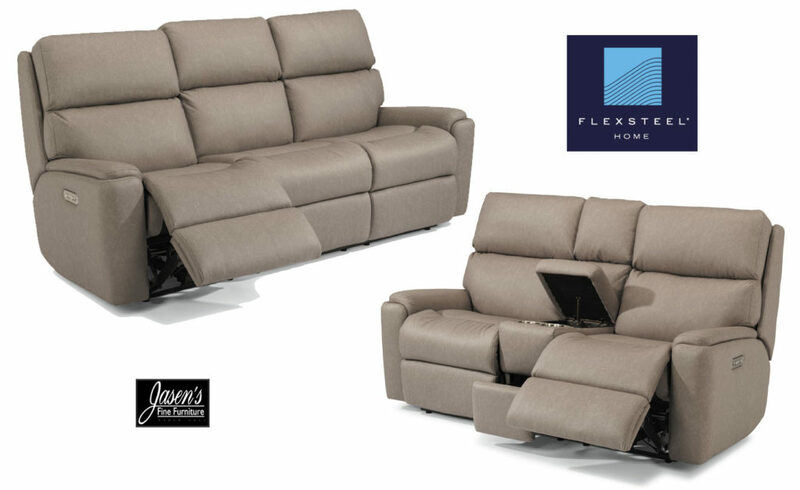 Flexsteel Kerrie reclining series comes in the fabric of your choice. Features padded through chaise, clean styling, and a higher than usual back for extra head support. Available in power and non-power mechanisms in Sofa, Love Seat, Console Love Seat, and Chair. 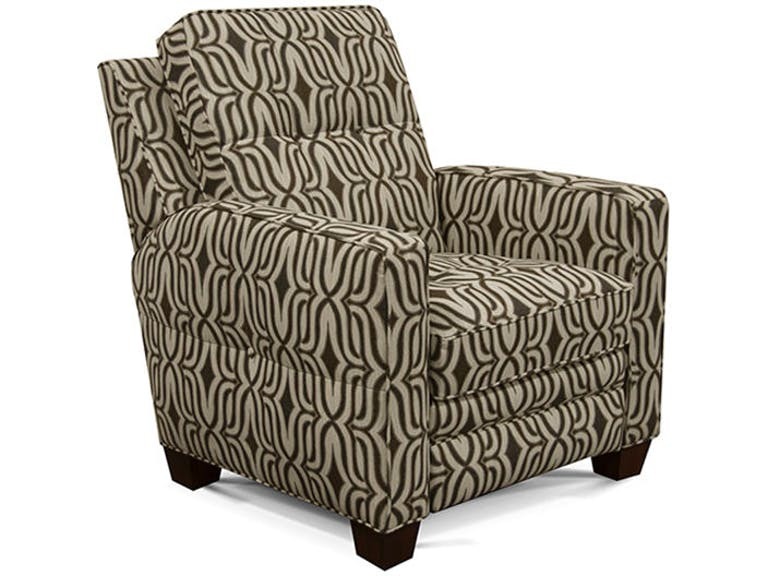 Best Joanna Recliner features wingback traditional styling with modern tapered legs to combine for a transitional appeal. 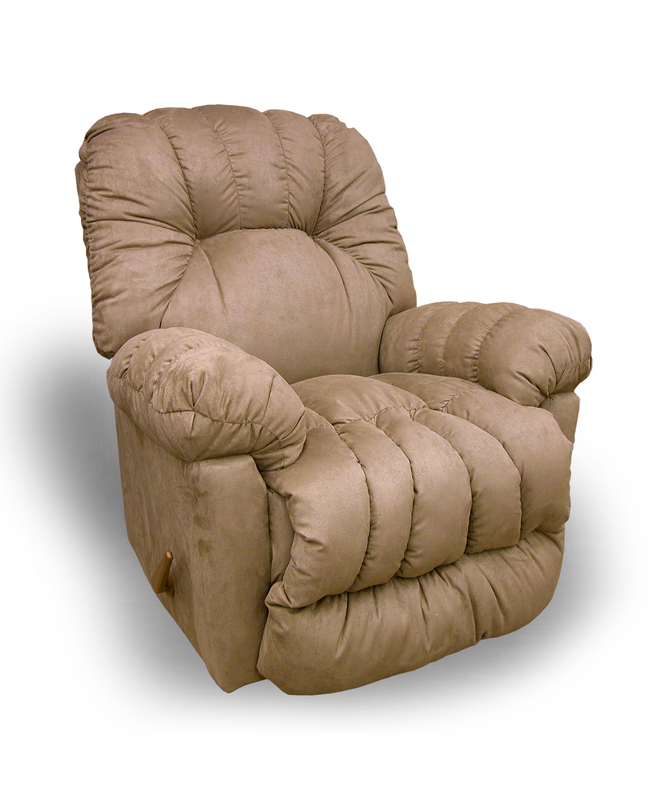 Recliner also features coil spring seat cushions with plush 2 pillow back. 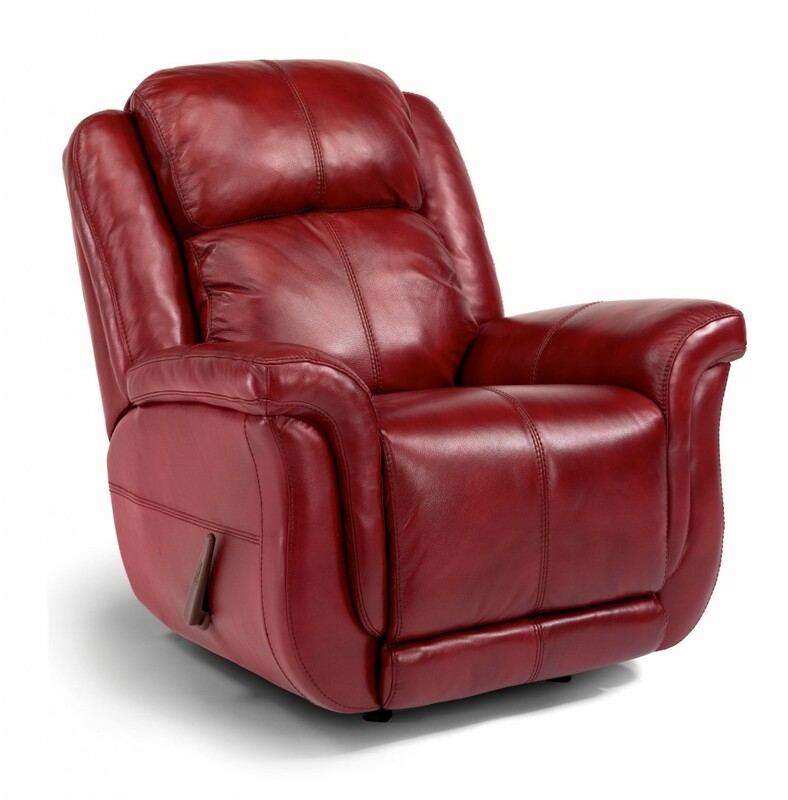 Recliner is also available in power or manual mechanisms with your choice of 100's of fabrics or leather. Made in USA! CLEARANCE, was $1029, now $929. 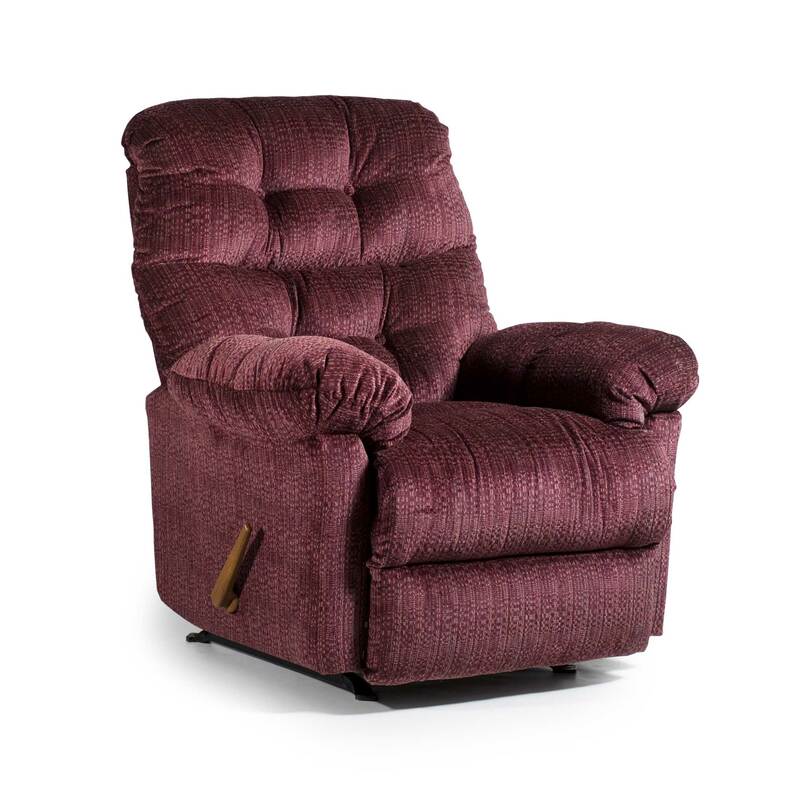 Best Patrick Recliner features wingback traditional styling with spool feet. Cushion features coil spring support for a firm feel. Chair is available in Fabric or Leather of your choice and mechanism can also be ordered in power. 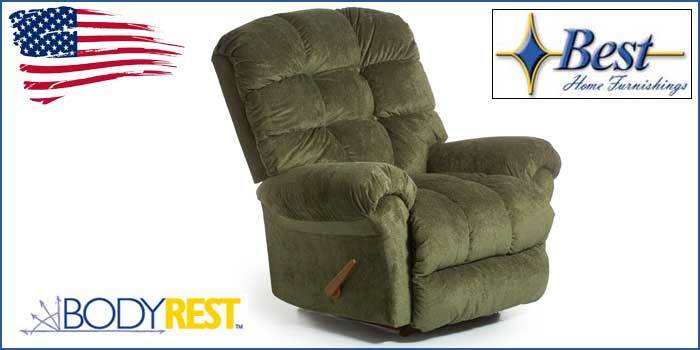 Best Codie Recliner is a petite recliner, but is also suited for medium sized recliners. Features 2 pillowed back designed to support the neck and back. 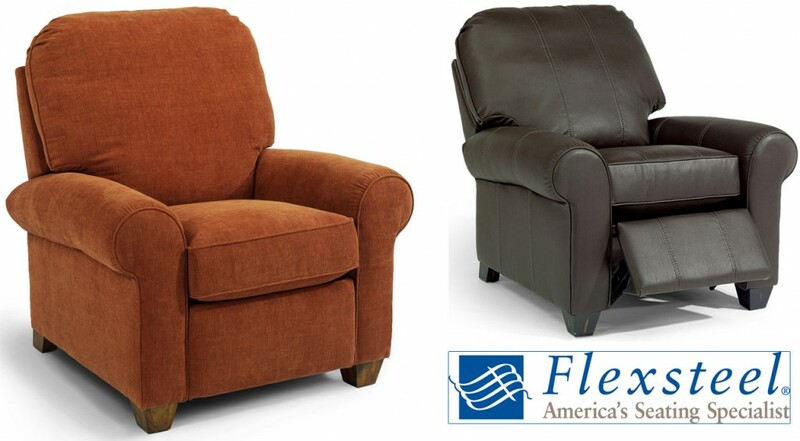 Available in Fabric or Leather in your choice of Power and non-powered rocker and wallhugging mechanisms, swivel glider recliner, and swivel rocker recliner. Made in USA! 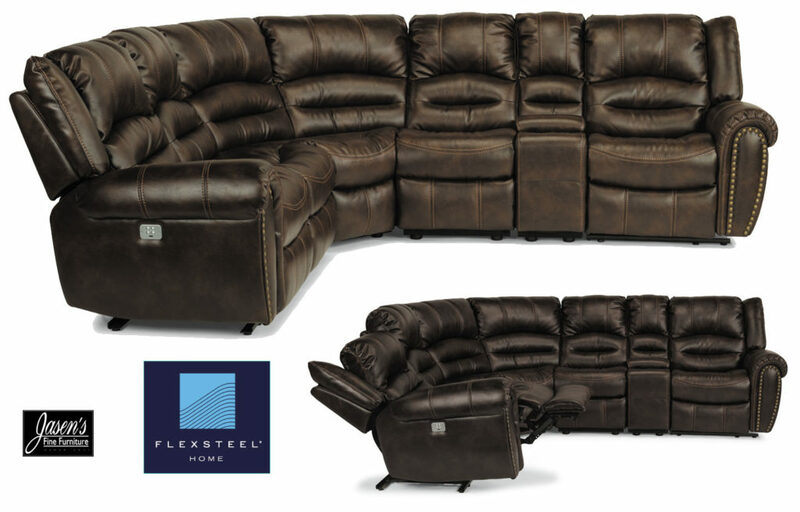 Plush, overstuffed cushions and a biscuit back, the Everlasting dual reclining sofa is the definition of comfort. The whole family will love to snuggle up with a warm blanket for movie night. Sofa can also be ordered in power or leather and love seat and chair (Brosmer) are also available for order. Sofa: H-41" W-88.5" Depth	39.5"
Love: H-41" W-64" Depth	39.5"
Console Love: H-41" W-77.5" Depth	39.5"
Chair (Brosmer): H-43.5" W-37" Depth 40.5"
Reclining Chair features memory foam layered on top of resilient, high-grade foam, top grain leather seating, contemporary styling with great tailoring, and NUVO chrome power reclining buttons. 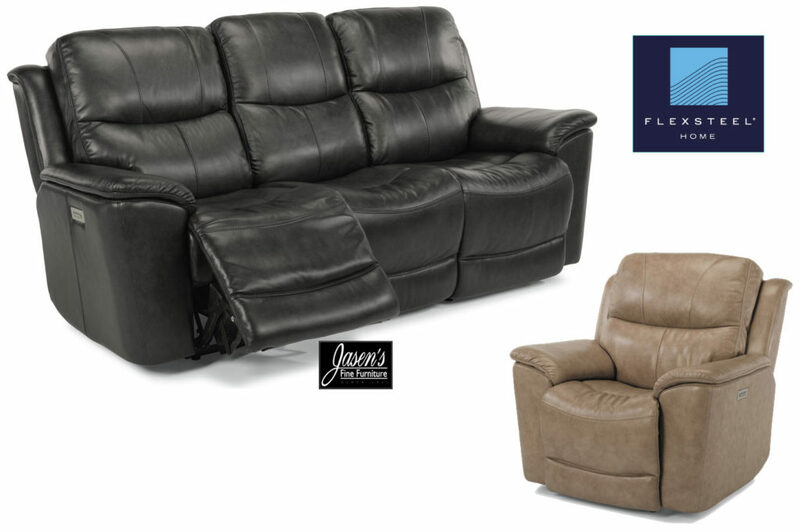 Also available in cloth, swivel glider, swivel rocker, love seat, console love seat, and sofa. 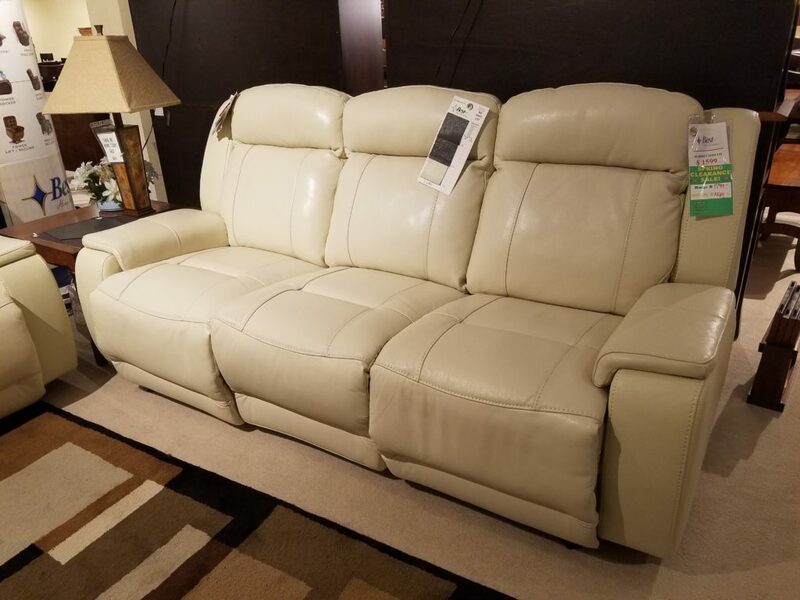 Dual Reclining sofa features memory foam layered on top of resilient, high-grade foam, top grain leather seating, contemporary styling with great tailoring, and NUVO power reclining buttons. Also available in cloth, manual mechanism, love seat, console love seat, and chair. A fresh take on this recliner doesn’t sacrifice style for comfort. The padded chaise pad allows for comfort from head to toe. The elegant Terrill will feel right at home in a highly styled sitting room with antique accents and stylish touches. With seemingliny endless cover options, the rolled-arm Terrill can take on a handsome look or appear more cheerful with a floral-patterned fabric. Traditionally styled reclining sofa is generously padded in the back and can be ordered in any cloth cover you choose. Available in manual or power, loveseat, console loveseat, and chair can be ordered in many various mechanisms. 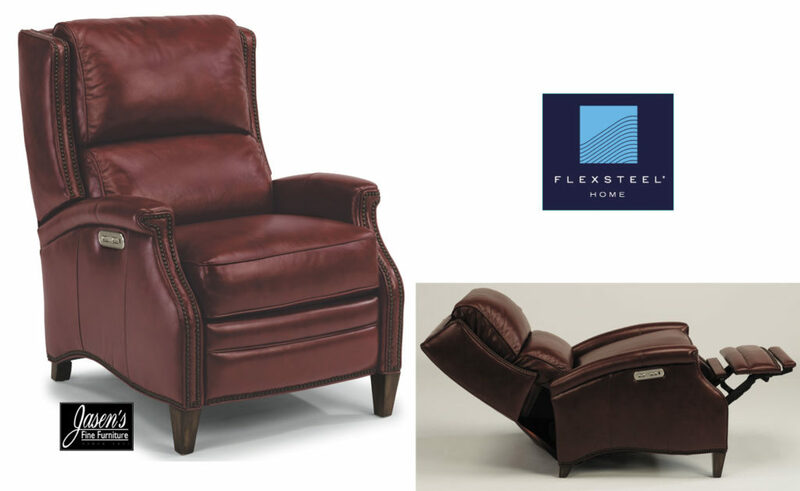 Flexsteel Thornton Recliner features plush attached back, sock arm, and tapered foot to accommodate any style of fabric you choose. Available in cloth, leather, any foot color of your choice, and manual push back or power mechanisms. A perfect companion to the Stationary Thornton Series. 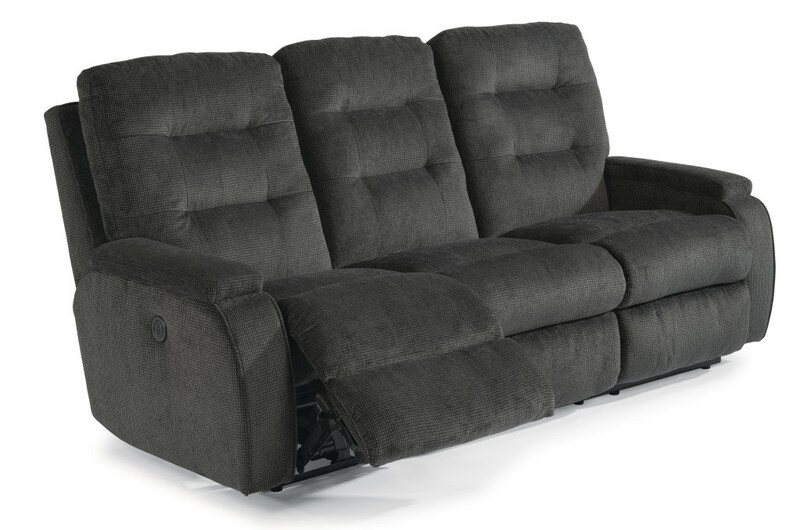 Classic comfort is imparted with this reclining series from it's tufted back style and it's modern power reclining mechanisms. Nailheads are optional on the rolled arms. Available in a huge variety of covers and can also be ordered in non-powered mechanisms. 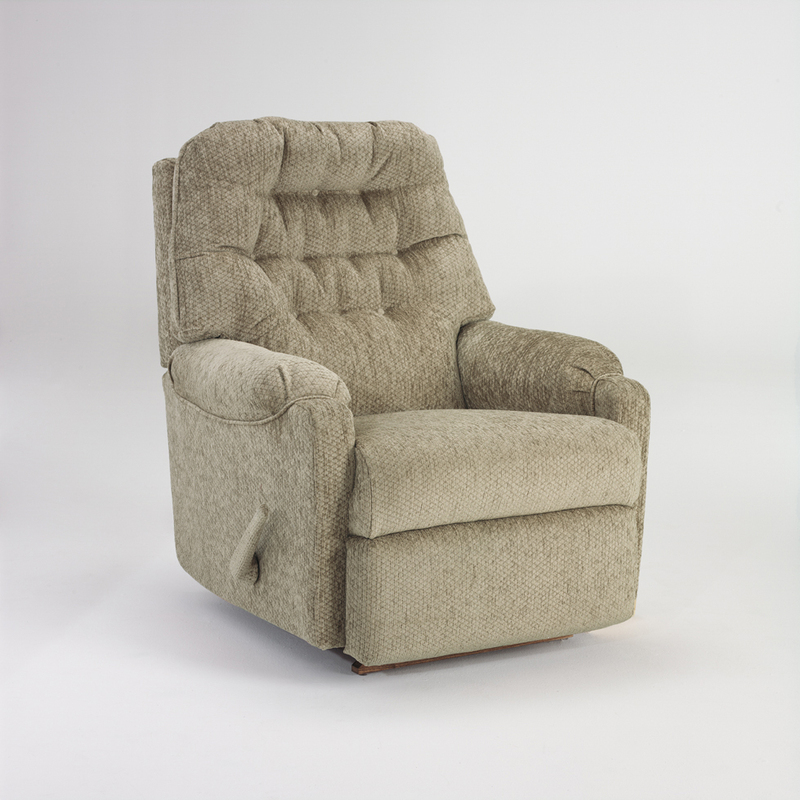 Medium size recliner comes in many fabrics as a space saver, rocker, swivel rocker, swivel glider, and power mechanisms. Made in USA. 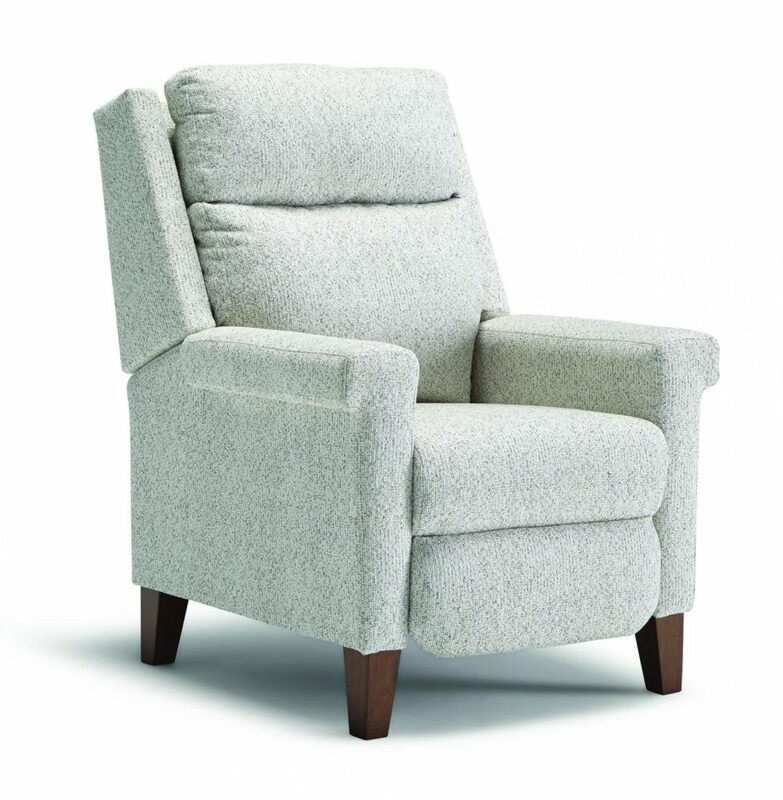 The smaller scaled Sondra recliner is styled for the more petite person. The Best Home Furnishings gravity operated reclining mechanism is easy to use, and the multiple base options available allows you to customize your comfort. Available in 100's of fabrics. Comes as a Space Saver, Swivel Glider Recliner, Power Space Saver, Rocker Recliner, Swivel Rocker Recliner, and Power Rocker Recliner. Weight limit 250lbs as lift or power chair. Best- Bodie. MADE IN USA!! Console Love: H-41" W-76" D-39"
Reclining Sofa and Loveseat can be ordered in fabric or leather/vinyl, and can be ordered in power reclining for additional luxury. Reclining Loveseat can also be ordered with center console that has cupholders and with/without storage drawer below. 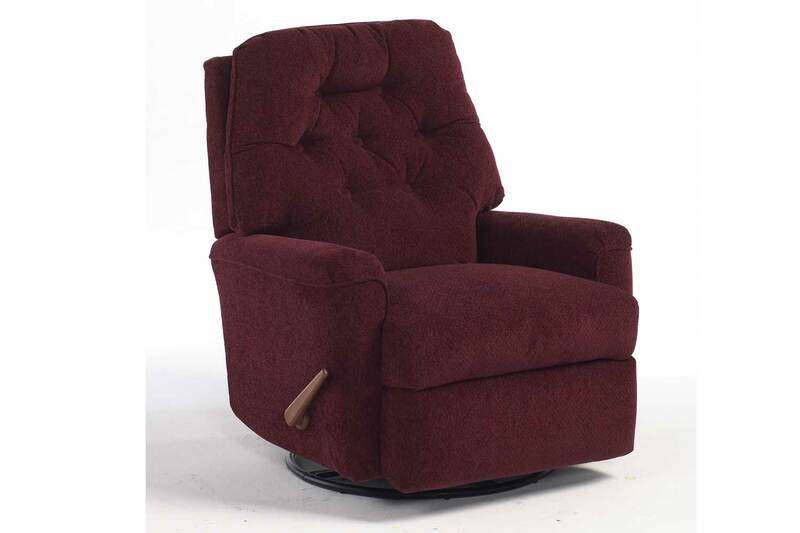 Matching chair is also available as a swivel-glide, swivel-rock, wallhugger, power, and rocking recliner. Warranties: Seat Cushion & Springs 1.5 years. Frame and Mechanism LIFE. MADE IN U.S.A.!! H-40" W-36" D-37". Chair is available in cloth, with or without contrast welting and the following mechanism of your choice: Wallhugger, Swivel Glider Recliner, Rocker Recliner, POWER ROCKER RECLINER, and POWER MOTION WALLHUGGER. Warranties: Seat Cushion & Springs 1.5 years. Frame and Mechanism LIFE. MADE IN USA!! 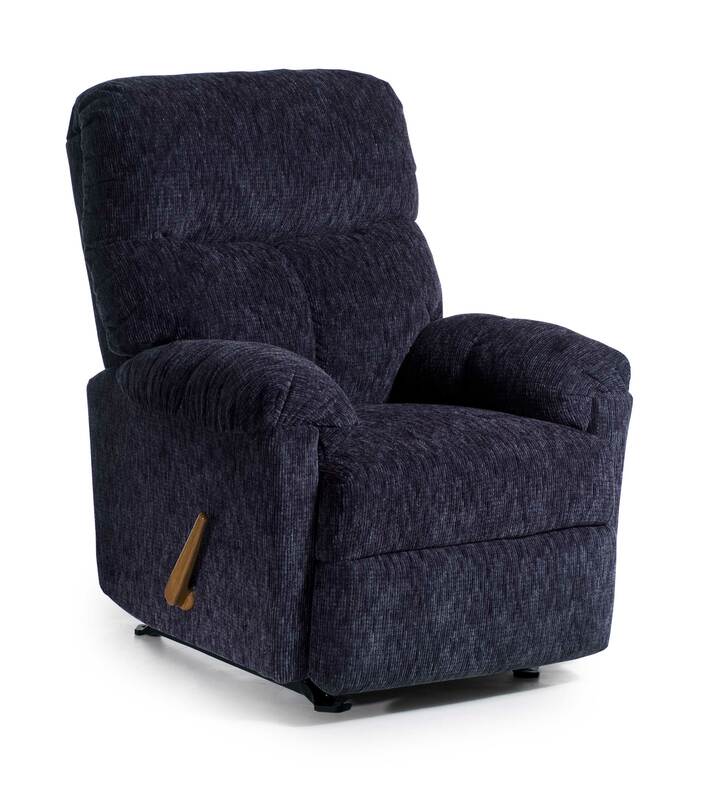 Height: 41.5" Width: 37.5" Depth: 39"
Petite chair is available in cloth with the mechanism of your choice: Wallhugger, Swivel Glider Recliner, Rocker Recliner, and Swivel Rocker Recliner. Warranties: Seat Cushion & Springs 1.5 years. Frame and Mechanism LIFE. MADE IN USA!! 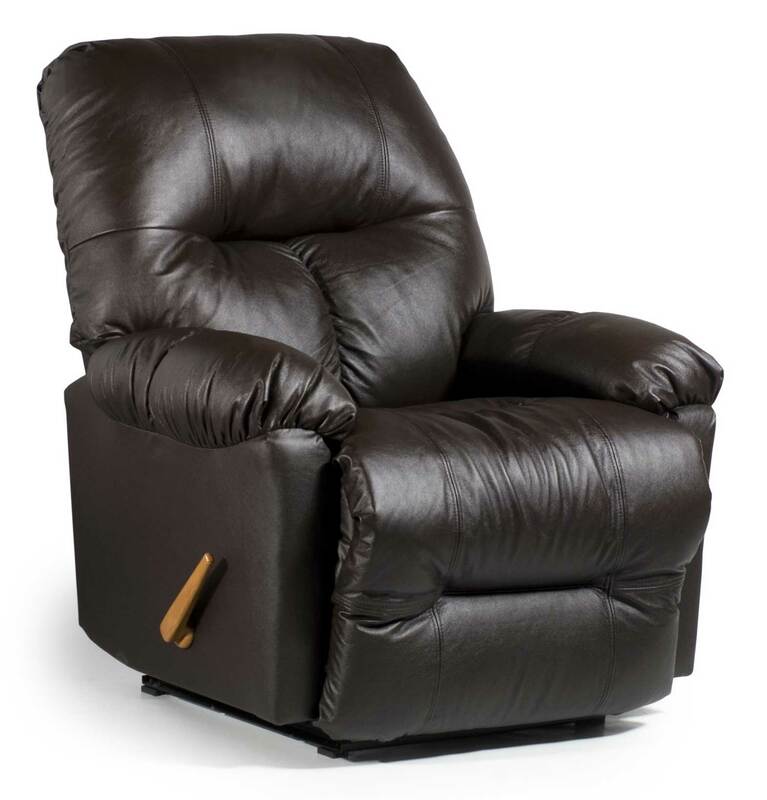 Height: 42" Width: 37" Depth: 39" Rocking Recliner- Chair comes in a variety of leathers, wallhugger, swivel rocker, and rocking recliner. Warranties: Seat Cushion & Springs 1.5 years. Frame and Mechanism LIFE. MADE IN USA!! 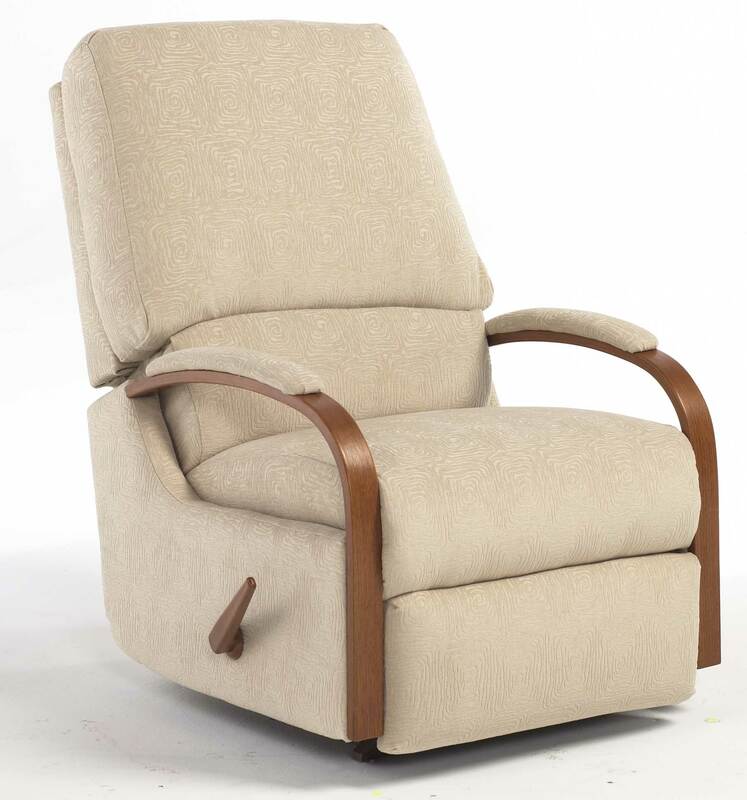 Height: 39" Width: 32.5" Depth: 34.5" Chair comes in a variety of fabrics, leathers, wallhugger, power chaise rocker or wallhugger, swivel rocker, swivel glider, lift-chair, and rocking recliner. Warranties: Seat Cushion & Springs 1.5 years. Frame and Mechanism LIFE. MADE IN USA!! Height: 44" Width: 41.5" Depth: 43" Best BODYREST mechanism is flattest reclining chair in the industry and the back acts independently from the chaise for infinite positions. 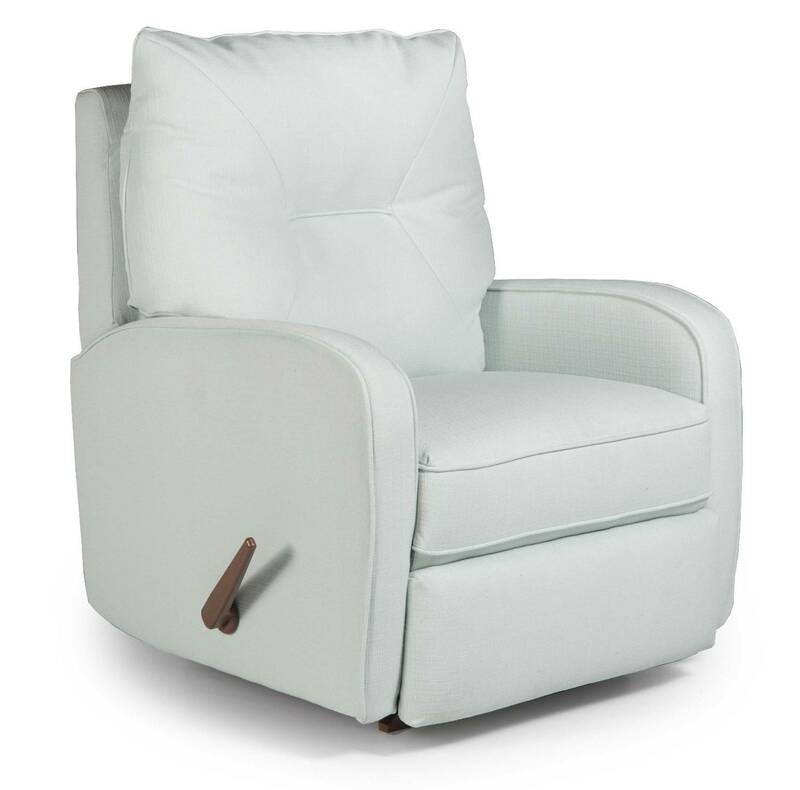 Chair comes in a variety of fabrics, leathers, lift-chair, and rocking recliner. Warranties: Seat Cushion & Springs 1.5 years. Frame and Mechanism LIFE. MADE IN USA!! 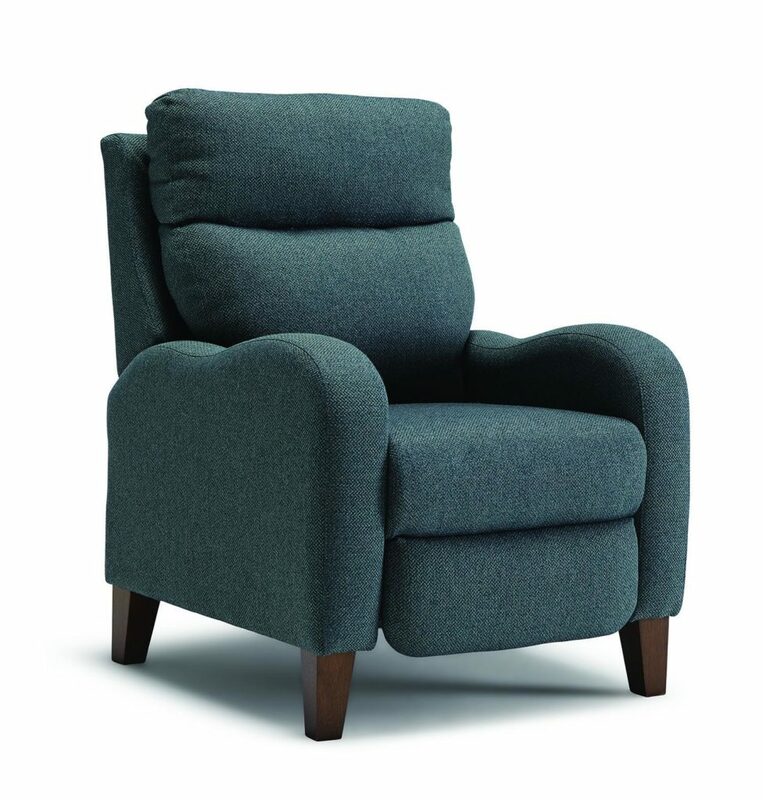 Height: 42" Width: 37.5" Depth: 38.5" Chair comes in a variety of fabrics, swivel-rock, swivel-glider, wallhugger, lift-chair, power-chaise rocker or wallhugger, and rocking recliner. Warranties: Seat Cushion & Springs 1.5 years. Frame and Mechanism LIFE. MADE IN USA!! 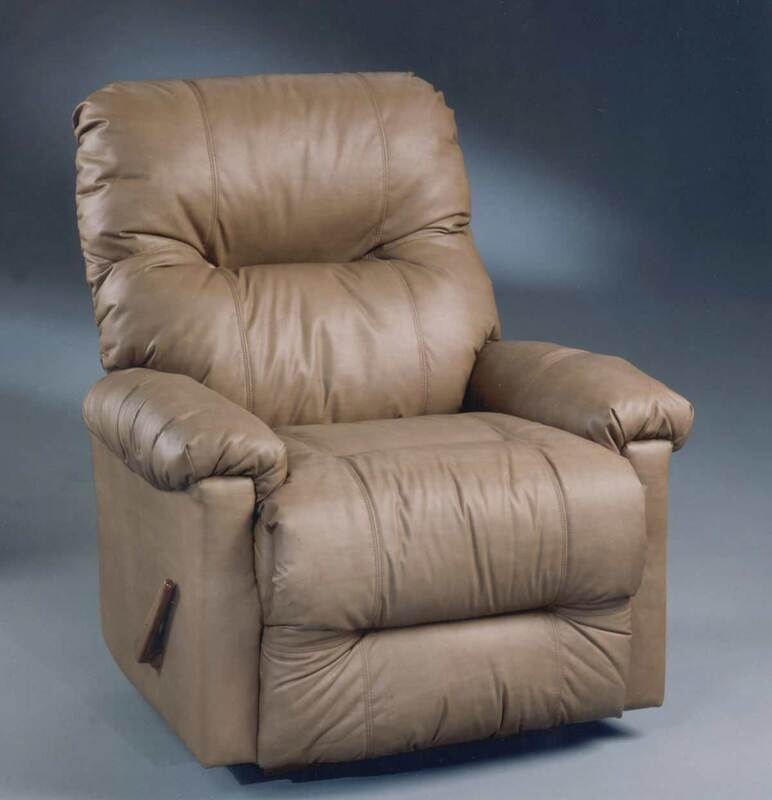 Height: 43.5" Width: 37" Depth: 40.5" Chair comes in a variety of fabrics, leathers, swivel-rock, swivel-glider, wallhugger, lift-chair, power-chaise rocker or wallhugger, and rocking recliner. Warranties: Seat Cushion & Springs 1.5 years. Frame and Mechanism LIFE. MADE IN USA!! Height: 45" Width: 43" Depth: 41.5" The BEAST series by Best Chair is for people who need a larger chair. 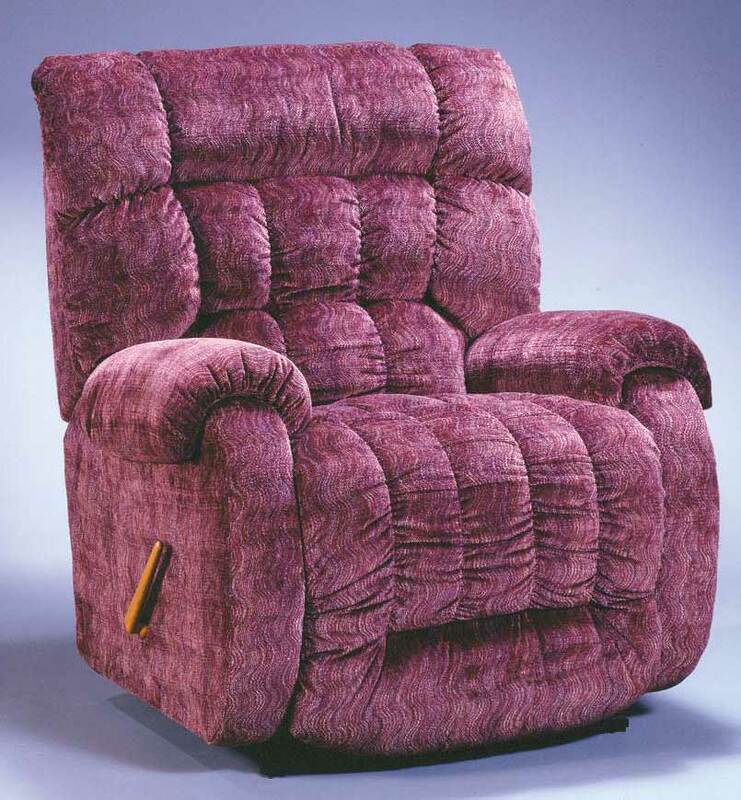 Chair comes in a variety of fabrics, lift-chair, wallhugger, and rocking recliner. Warranties: Seat Cushion & Springs 1.5 years. Frame and Mechanism LIFE. MADE IN USA!! Height: 49.5" Width: 45.5" Depth: 47" The BEAST series by Best Chair is for people who need a larger chair. Chair comes in a variety of fabrics, leathers, and is only available as a wallhugger. Warranties: Seat Cushion & Springs 1.5 years. Frame and Mechanism LIFE. Best- Roscoe. MADE IN USA!! Height: 45.5" Width: 44.5" Depth: 43" The BEAST series by Best Chair is for people who need a larger, heavier duty chair. 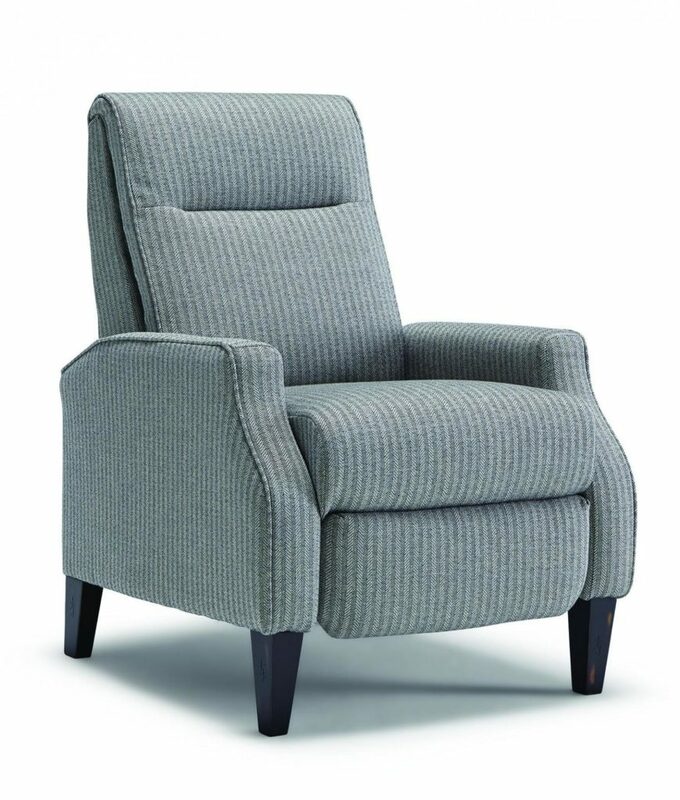 Chair comes in a variety of fabrics, lift-chair, wallhugger, and rocking recliner. Lift chair has a 350lb weight limit. Warranties: Seat Cushion & Springs 1.5 years. Frame and Mechanism LIFE. Best- Pike. MADE IN USA!! Height: 41" Width: 31" Depth: 38" Chair comes in a variety of fabrics, 2 wood colors for the arms, swivel-rock, wallhugger, and rocking recliner. Warranties: Seat Cushion & Springs 1.5 years. Frame and Mechanism LIFE. Overall - Height: 40.5" Width: 33" Depth: 36.5". Petite sized rocker-recliner. Can be ordered in hundreds of fabrics and as a wallhugger, swivel-glider, swivel-rocker, and a lift chair. Overall - Height: 41.5" Width: 38" Depth: 38.5". Can be ordered in hundreds of fabrics and as a wallhugger, swivel-glider, swivel-rocker, and power rock-recliner/wallhugger. Best Brosmer. 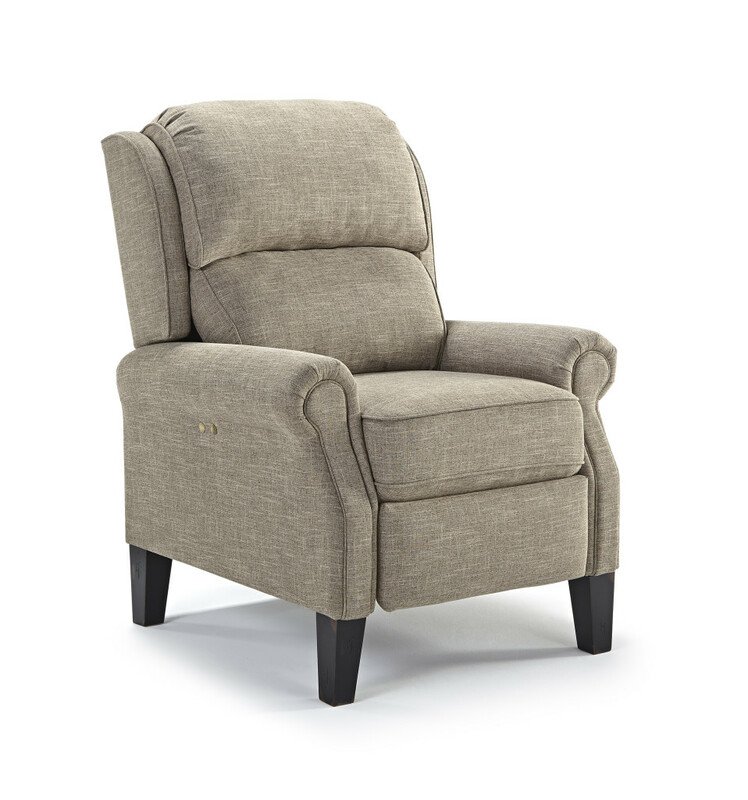 Classic comfort and style make this recliner very versatile. Available in cloth or leather, heat & massage, power chaise, swivel glider, rocker, wall saver, and lift chair with 275lb weight limit. MADE IN USA! h- 44"; w- 37"; d- 41"